2 April: Maarat Nouman Hospital, Idlib. 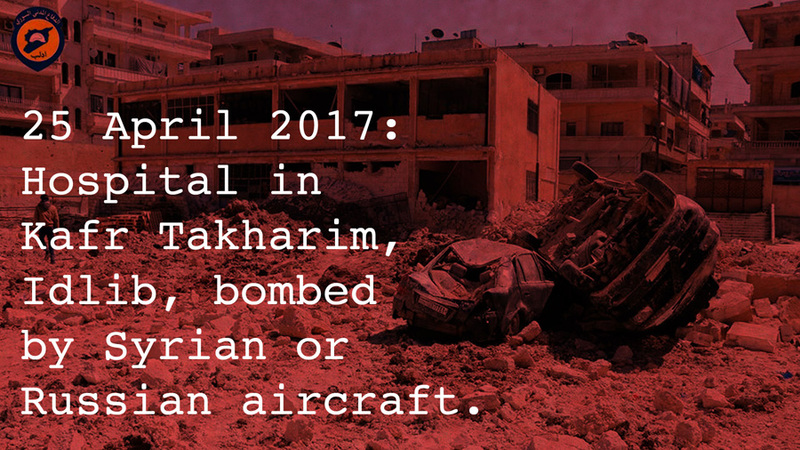 4 April and 16 April: Al-Rahmeh Hospital in Khan Sheikhoun. 4 April and 8 April: Heesh Clinic, Idlib province. 17 April: Ikhlas Hospital in Shnan, Idlib. 17 April: Erbin Hospital, Eastern Ghouta near Damascus. 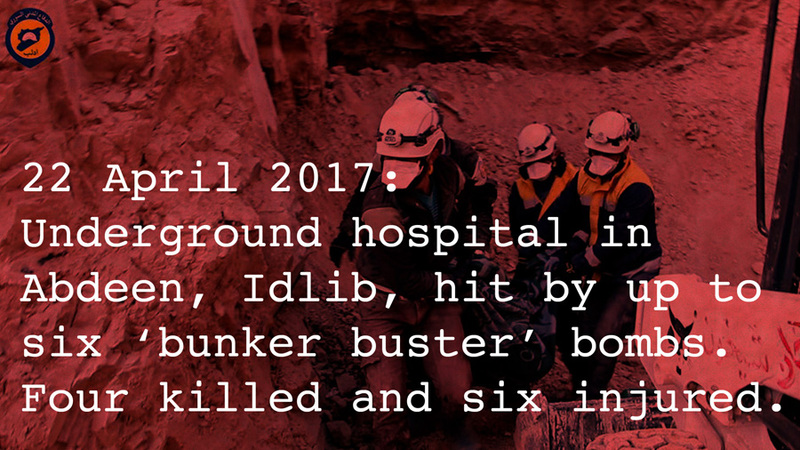 22 April: Central Hospital, Abdeen, Idlib province. 25 April: Wasim Hasino hospital in Kafr Takharim, Idlib province. 25 April: Dowaila Hospital in Kafr Takharim, Idlib province. 26 April: Naseeb Hospital, Daraa. 26 April: Al Latamneh Hospital, Hama. 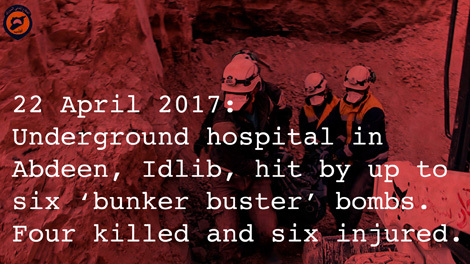 27 April: Al Dair Al-Sharqi Hospital, Idlib. 27 April: SAMS Ambulances and Evacuation Medical Point, Maar Zeta, Idlib province. 28 April: The maternity hospital in Kafr Takharim, Idlib province. 28 April: Al Na’eema field hospital, Daraa province. Russian and Assad jets are committing war crimes targeting medical personnel and facilities in Syria. It is beyond incomprehensible that medical facilities are targeted by one of the permanent members of the UN Security Council; a state which is considered part of the ‘civilised world’. The Syrian people have lost their faith in the UN which has been failing them for over six years. Security Council motions are repeatedly vetoed by Russia, and other members have failed to exert the required pressure on Russia to change its approach. Destroying hospitals, targeting health care workers (over 700 have been killed so far in Syria in the last 6 years), killing patients on their bed sides and destroying humanitarian aid convoys are amongst the heinous war crimes perpetrated by Russian and Assad forces. 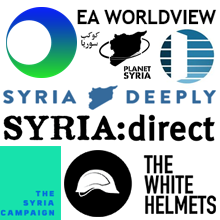 This is not to mention the military and economic support that Russia continues provide to the Syrian regime as well as the diplomatic support in the UN. The Syrian people feel that the so-called political solution has failed them. Russia is unable to play a positive role. It is in fact part of the problem with regards to the criminal Assad regime. Urgent actions are needed as more war crimes are committed on the medical facilities in Syria. We demand the urgent protection of hospitals, health workers, civilians, and civilian infrastructure in Syria. If the UN Security Council is unable to overcome deadlock due to the abusive Russian vetoes, then the UK should pursue an emergency special session in the UN General Assembly through the ‘Uniting for Peace’ mechanism and should push for concrete recommendations for action to be made through the General Assembly. This should be in addition to the imposition of sanctions against Russia for its actions in Syria. 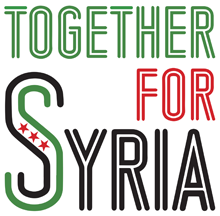 It is not acceptable to keep watching on as the slaughter against Syrian civilians continues in real time. Condemnations are not enough. Action is needed to enforce the protection of Syrian civilians and hospital facilities. Those who have committed war crimes must be brought to justice. Otherwise, history will remember our generation as one of failure.